Info "Don't be scared; all YOU gotta do is let go!" Bungii! is a microgame in WarioWare: Smooth Moves. During stages, it always appears after playing BYOM or All Wound Up—regardless of whether it appeared before or not—as its purpose is to untangle the player's wrist strap after winding it up in one of those microgames. In the Temple of Form, this microgame appears as a "bonus stage" after playing through all three levels of the two aforementioned microgames. Bungii! can also be played separately in the Remote Control section. 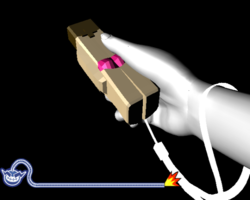 The player must simply let go of the Wii Remote and let it fall. The Wii Remote looks like a lady, and the person dropping it in the game is the player's Mii. 1st level difficulty: The Wii Remote is dropped from the Leaning Tower of Pisa by the player's Mii. 2nd level difficulty: The Wii Remote is dropped from a rainbow above the Tower. 3rd level difficulty: The Wii Remote is dropped from an astronaut's hand in outer space, with the Tower barely seen in the distance. This is the only microgame in the WarioWare series to have an unknown creator. This page was last edited on December 1, 2018, at 17:43.